Strange things happens in New Zealand. 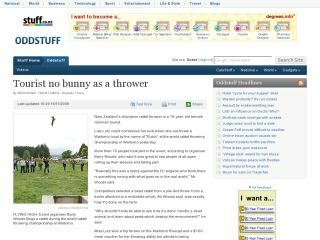 A German tourist has been crowned New Zealand’s champion rabbit-thrower [^] in Waitomo according to stuff.co.nz. Lisa Lutz managed to overthrow the Kiwis by tossing a dead rabbit into a trailer attached to a motobike; something seen across farms in New Zealand and Australia. Event organiser Barry Woods said that the event was staged as a stand against political correctness. Rabbits are not native to either country, and cause a great deal of damage to indigenous flora and fauna. Only dead rabbits were used in the competition. Posted in: New Zealand, Odds & Ends.